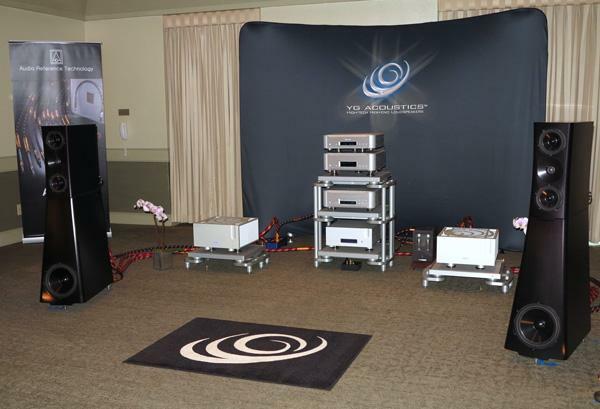 The fourth California Audio Show had just come to an end, but from the vigor with which the Music Lovers Audio staff launched into take down (above), it could have just as well been set-up day. Perhaps some of their energy reserves arose from the fact that attendance seemed significantly lighter than anticipated, even on Saturday. Why have I devoted so much time and energy to writing up rooms at what was essentially a modestly sized regional show? To my way of thinking, exhibitors, both newbies and industry regulars, invested so much time and energy into making a good showing at CAS that I owe it to them to help get the word out far beyond the limited number of attendees. Hey, we were in earthquake country, the land from which Carole King may have received inspiration to write, "I Feel the Earth Move Under my Feet." Then again, she could have received equal inspiration from the Von Schweikert VR-100 XS 4-piece loudspeaker system ($140,000/pair). Paired with the debut of Raven Audio's Silhouette monoblock amplifiers ($12,995/pair) and Reference Silhouette preamplifier ($12,995), it sure inspired me with its ability to move air with musicality. There's nothing like highlighted text from Stereophile brother Art Dudley to get a fellow writer's attention. Then again, so do the Burwell & Sons Homage Series loudspeakers ($80,000/pair), whose price will tempt many vintage horn lovers to burn a hole their pockets. This front view of the Music Lovers Audio/Musical Surroundings room gives but a hint of the huge, expansive, amazingly coherent, air-filled, three-dimensional soundstage of this system. 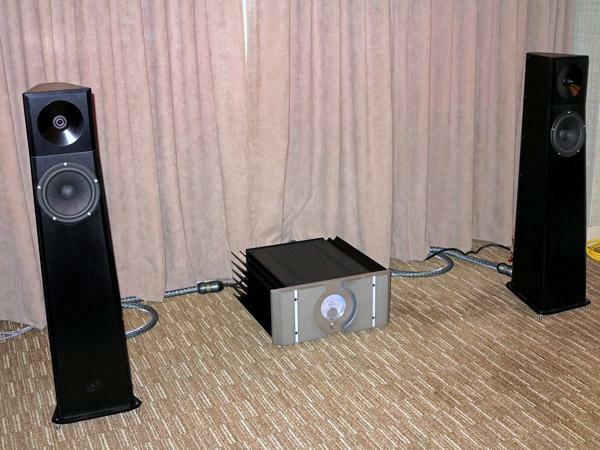 My hands-down "Best of Show," the room was dominated by dominated by Wilson Audio Alexia loudspeakers ($48,500$50,000/pair, depending upon finish)another pair of Alexias now resides at John Atkinson's home for reviewand Spectral Audio DMA-400RS monoblock amplifiers ($28,000/pair). 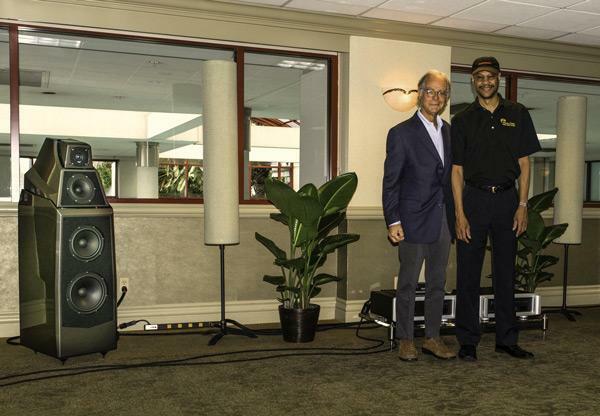 Peter McGrath of Wilson Audio (left) and Hugh Fountain of Music Lovers Audio (right), as well as Garth Leerer of Musical Surroundings, deserve kudos for their set-up prowess. While I didn't reach anywhere near the altitude of the planes leaving SFO's runways, I was finally making headway on the Westin's 3rd floor. The home of many of CAS' exhibits, it got even homier when I entered the room sponsored by Pass Labs. Pass rarely if ever makes an appearance at a consumer show, but with no dealer in the greater Bay Areathe closest is Reno Hi-Fi, which happily arranges in-home demos for CA consumersthe company's Desmond Harrington and Kent English finally decided to let "local" consumers hear why so many critics rave about Pass products. I've previously praised EnigmAcoustics' Sopranino self-polarizing electrostatic supertweeter ($3690/pair), which I first encountered at T.H.E. Show Newport Beach. The Sopranino claims a flat response to beyond 40kHz and fully passive operation without the need of external bias. Here I heard a pair of Sopraninos in two different configurations. . .
Far more beckoned on the lobby level, but you can only keep them down on the farm so long. Eventually, the lure of unexplored territory pulled this Cancer crab out of the questionable security of his shell onto the wilds of the Westin's second floor. There I encountered the wildest of them all, Sean Casey (above), spinning platters in the Zu Audio room. Time to settle into deeper listening. 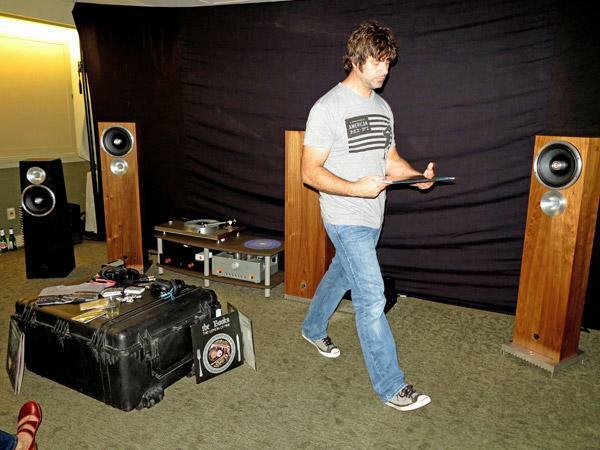 We'll spend a bit of time in Loggie Audio's second room, built around Ypsilon and (TEAC) Esoteric electronics and the equally excellent YG Acoustics Sonja 1.2 loudspeakers ($72,800/pair), not only because it sounded so good, but also because it presented the US debut of what may very well prove to be a major cable line. 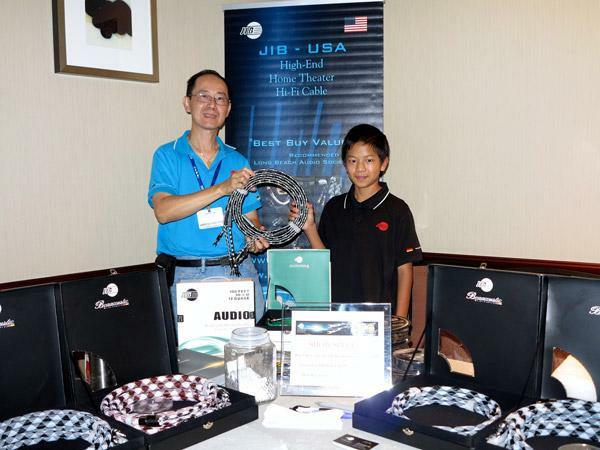 JIB cabling, long linked to its factory in Berlin, has now birthed a distinct US branch. Aptly named JIB-USA, it's located in Fremont, CA. At CAS, Allen Ong and his son displayed, among other models, the company's new DSP-001 speaker cable ($7150/2.5m pair). Composed of UP-OCC that is cryogenically treated, insulated with Teflon, and terminated with rhodium connectors, the cable made its silent show premiere. 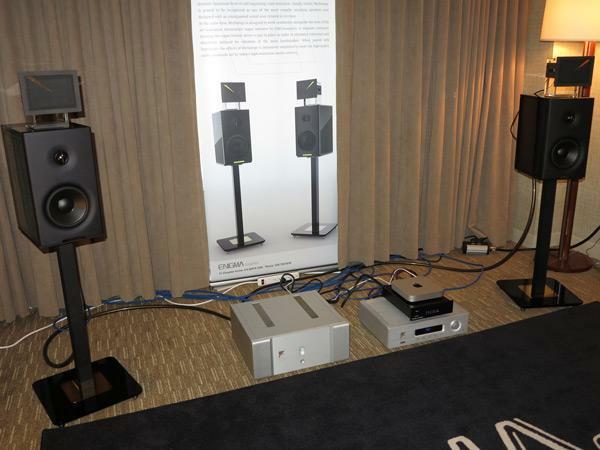 Ensconced in the third hotel in its four-year history, the three-day California Audio Show opened on August 9, 2013 in the five-floor Westin Hotel in Millbrae, CA. 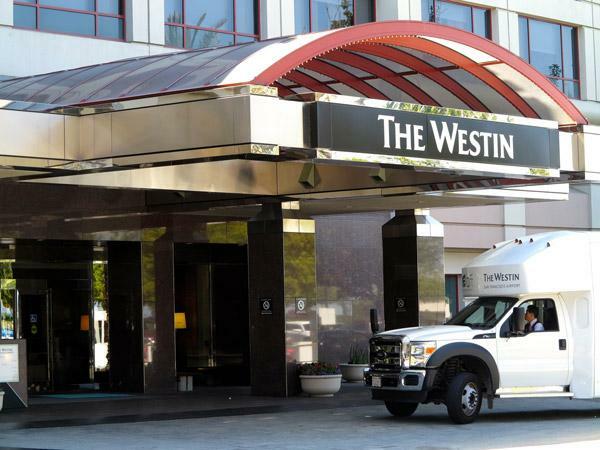 Otherwise known as the Westin SFO, the hotel resides on One Old Bayshore Highway, a hefty stone's throw from San Francisco Bay, directly across the water from the airport runway where Asiana Flight 214 crashed on July 6. 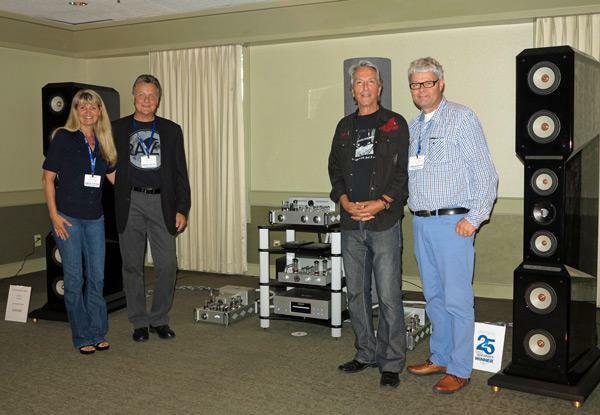 The fourth annual California Audio Show is poised to get underway August 911 in a new venue, the Westin San Francisco Airport (Westin SFO), in Millbrae, CA. 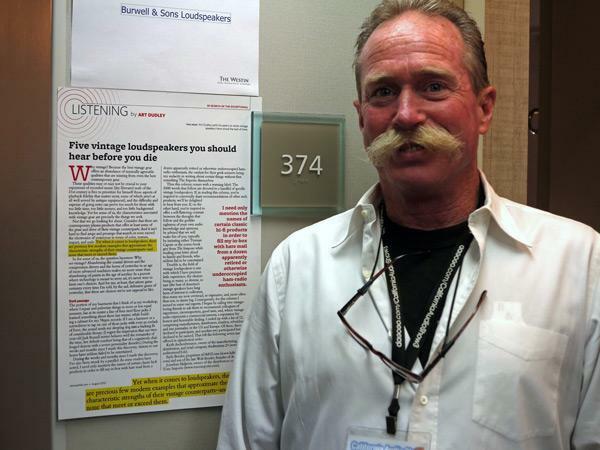 The only West Coast consumer fine-audio show between Newport Beach (in very southern California) and Denver, CAS4 is expected to draw close to 1000 audiophiles per day to listen to systems in at least 41 sound rooms, 16 of which are of medium or large size.